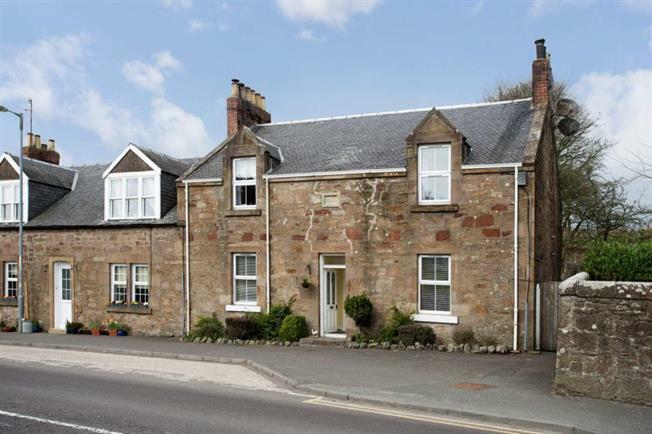 2 Bedroom Ground Floor Flat For Sale in Maybole for Fixed Price £92,000. This is an immaculately presented two bedroom lower conversion located in the beautiful village of Kirkoswald and offering accommodation extending to lounge, dining kitchen, bathroom and two double bedrooms. Externally there is a private patio area and extensive split level gardens. Entry is into the welcoming reception hallway with access to all main apartments and a generously proportioned, walk-in storage cupboard. To your right you will find the lounge which is semi open plan to the dining kitchen and features laminate flooring, a press style cupboard, feature fireplace with working fire and double glazed windows to the front. The modern & stylish kitchen is finished to a high standard with a range of both wall and floor mounted units with fridge freezer, washing machine and integrated electric hob with oven under and hood over. Further benefits include laminate flooring and recessed ceiling spotlights while a double glazed door opens to the private patio area and onto the beautiful gardens. To the rear of the property is the modern and stylish family bathroom with a suite to include wash hand basin, WC, bath and a walk-in 'wet room' style shower. The two double bedrooms complete the accommodation with both benefitting from fitted carpeting. To the rear of the property there is a private patio area and stairs leading to the extensive split level mature gardens which are laid to a combination of lawn & bark with shrubbed border areas with the first level being laid with timber decking giving a lovely area to sit and enjoy the sunshine.